I love taking photographs. My interest in the art started when I was still in grade school and I absolutely adored my very first instamatic camera. I am now a mother to three young adults, and a grandmother to an adorable little 8-month old baby boy. Although I have not taken my love for photography to a professional level, I still enjoy walking around the neighborhood with a digicam in my pocket and my smartphone ready to capture an extraordinarily beautiful moment. My photos have always been random, candid shots of mundane and ordinary things. There is so much beauty in stuff we usually take for granted. I guess I just have a different perception of "beauty." Take for example this first photo. 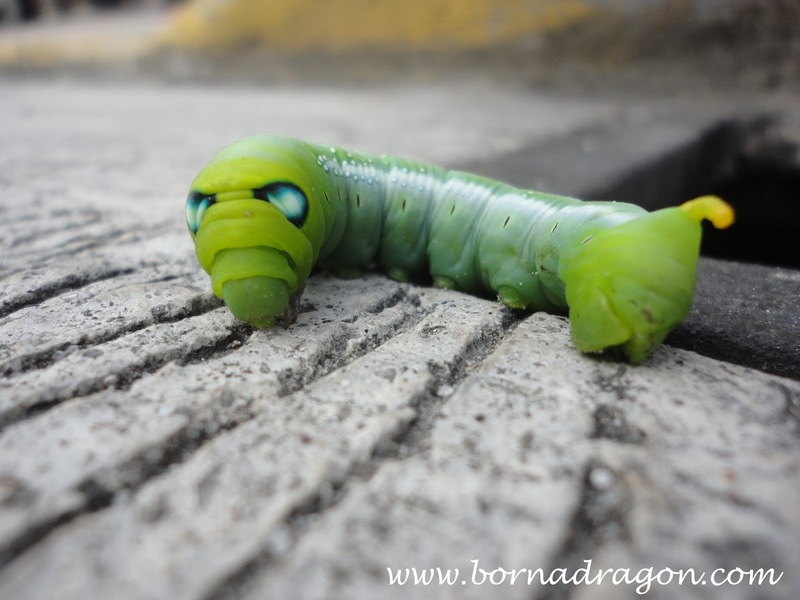 I saw this beautiful butterfly (Papilio demoleus or "Lemon Butterfly") laying on the sidewalk. I took pictures of it and was amazed because it kept still, like it was allowing me to take pictures of it. Sadly, after a couple of shots, I found out that the butterfly was dead. Its wings spread out as if in flight. Beautiful, even in death. Nature for me, is one of my choice subjects to depict beauty. I love flower photographs, especially after a downpour. The petals look fresher, the leaves greener. This next photo was taken while I was walking to the grocery store. I chanced upon this lovely cluster of little red flowers. My friend, a professional photographer said, "Anything red is always beautiful in photographs." Indeed, he was right! The miracle of life in itself is a thing of beauty. A lone, wild pepper plant thriving and surviving in a small patch of soil along the side of a street bears fruit. The beauty of life unfolding in the most difficult of situations. There is so much beauty around me and my heart just fills with joy just to witness these simple things. It is in these little joys that my faith in God is strengthened. Its been raining for days on end, but I always make it a point to look at the world from a different angle. Rain provides water, which supports life. If I could only hear it, I am sure there is a joyful song sung by all creatures of the earth every time it rains. I have captured some of these moments using my trusty little digicam. A caterpillar finding its way to a tree branch, to hie away for a time and grow its wings. I have changed the way I look at beauty by using my heart instead of my eyes. My faith guides me to see things differently and to appreciate these blessings. I know there are so much more around me waiting to be appreciated for their unique beauty. My wish is to be able to immortalize moments of beauty with a better smartphone camera. I have come to know that Huawei P9's camera will be able to provide me with clearer, crisper photos. Engineered with Leica technology, I am sure it will give me print-ready photos! I can give my digicam a rest and just have one device with me every time. Huawei P9's primary camera's specifications are Dual 12 MP, f/2.2, 27 mm, Leica optics, phase detection autofocus, dual-LED (dual tone) flash. Although I do not take "selfies," it is also good to know that its secondary camera has these features - 8 MP, f/1.9, autofocus, 1080p. These features alone are reason enough to dream of owning one! Huawei P9 will definitely Change The Way You See Mobile Photography! Until that dream materializes, I will continue on my journey of life, taking photos along the way and sharing it with others so that they too, may change the way they see beauty. I love to take photographs as well and looking for beautiful things in nature. That catepillar looks amazing - beautiful colours and details. Your photos are so gorgeous! I too fell in love with photography when I was in grade school. It's a wonderful art! I love the photos you have posted. Seriously, they are too professional. Beautiful pictures and such inspirational words. I love photography as well because of how I can capture His beauty that He has created in everything. To me even run down buildings are a beautiful because of the stories they tell. the way you used these pictures to illustrate the post say alot on the post title... great word to make one stronger in mind and spirit.. keep posting. I changed the way that I see beauty too. Sometimes I see the beauty in the little things too. It's amazing what you can see when you look properly. Can't imagine appreciating spiders though... ewe. I think you take lovely pictures and I never would have thought you used a smartphone to capture those. Life is so much better when you choose to see beauty through your heart and not your eyes. 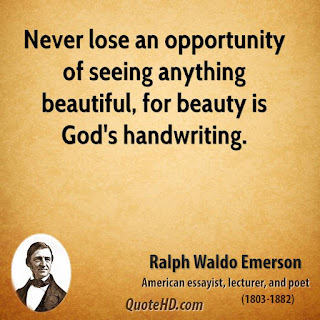 You are right - there is beauty all around us. We have to be present in the moment to notice. These closeups are great. There's definitely beauty all around us. This is a good reminder that there are constantly species going about their business around us. Your shots are all awesome. And I agree. We should see beauty on everything. Great post! The pictures are beautiful. I love taking photographs too! I like the caterpillar photo, looks really relaxing! Beauty is different depending on who see it. I agree with you totally. There is so much beauty in nature. Sometimes I just like to sit and enjoy the beauty along with the peacefulness and serenity. So true! Beautifulness surrounds us, we just 'can't see it', sorta. Great photos also! 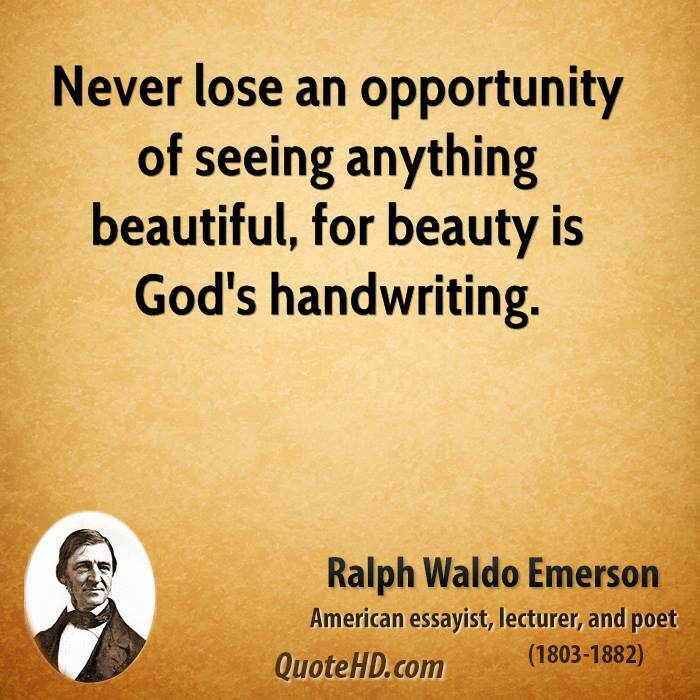 Emerson does have some lovely life quotes. I'm happy to see the perspective in your post. Beauty is found everywhere, it's true. Oh cool…I have never seen a snail up close like that before. We have a lot of slugs when it rains, but never a snail with a shell. Very cool photographs – I love nature shots. Those photos are all beautiful. I wish I had the eye for photography. I would frame all of these. I am with you when it comes to the crazy love I have for taking photographs anytime. These are some beautiful pictures from you and I love the way you admire nature like how I do. You take some great pictures. I also love the theme of this. The picture of the butterfly and the snail were particularly powerful as you don't typically think of death or certain creatures as being beautiful. When I want to escape I love to go outside. It is so relaxing. I feel like I reconnect to myself.